Tamago kake gohan (卵かけご飯, egg on rice), or Tamago gohan for short (also abbreviated as the Latin letters TKG) is a popular Japanese breakfast food consisting of cooked rice topped or mixed with raw egg and soy sauce. Tamago kake gohan, popularly abbreviated TKG, is a dish in which a raw egg is put on top of or mixed with rice, or a recipe for such a dish. Beaten eggs are sometimes used, as are non-beaten. Sometimes only the yolk of the egg is used. The dish is known in Japan as "tamago kake gohan" (gohan means rice or food and kake means "splashed" or "dashed"), "tamago kake meshi" (meshi means rice or food), "tamago gohan", or simply "tamago kake". Tamago (egg) may be written 玉子(cooked egg), as an alternative to the single character 卵(raw egg). 1. Put a fresh egg into the Kobachi (小鉢, small bowl). 2. Pour a desired amount of soy sauce to taste into the Kobachi. 3. Mix the egg and soy sauce together, if the soy sauce makes the mixture somewhat black it is no problem. 4. Dig a hollow in the center of the cooked rice in the Chawan (茶碗, a rice bowl) using chopsticks. 5. Pour the egg/soy sauce mixture into the hollow. 6. Stir the mixture into the rice. The rice becomes a golden color. ^ Suzuki, Mami. "A Raw Egg On Rice Is A Japanese Feast". tofugu.com. 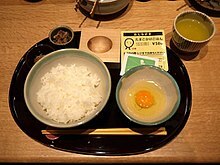 Wikimedia Commons has media related to Tamago kake gohan. This page was last edited on 23 November 2018, at 09:45 (UTC).